A good touchscreen laptop with a mediocre screen. Large responsive touchscreen; Ergonomic keyboard; Price. Poor display quality; Mediocre battery backup; Heavy. Windows 8 has given rise to an unexpected breed of computing devices that had probably never been envisaged when the new OS was being designed. While ideally fit for tablets, we are seeing an increasing number of laptops with touchscreens cropping up with some of them sporting screens exceeding 15". Toshiba had recently launched a huge line-up of laptops to replenish its rather dormant product segment in India. 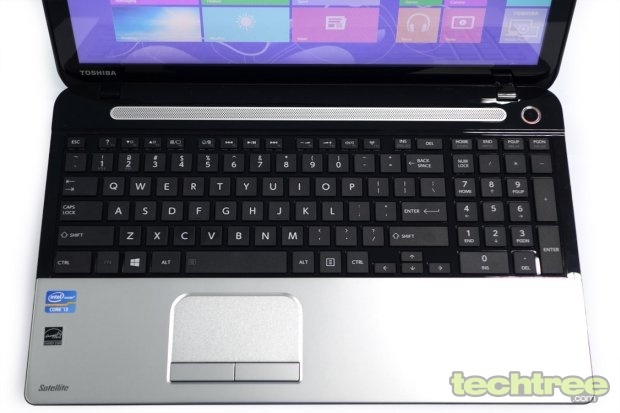 The Toshiba Satellite C50-A I0110t we have today is the only touchscreen model out of the 18 new models. The Satellite C Series is the most populous from the company and is being advertised as stylish and trendy. 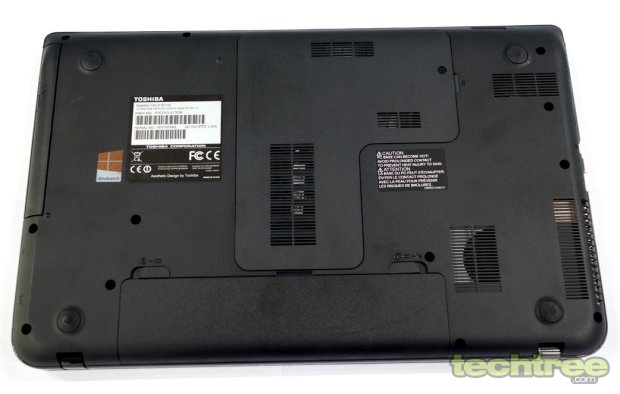 The Toshiba Satellite C50-A I0110t appears like aluminium when closed with the lid having a glossy finish. The appearance is deceptive as the body is entirely made of polymer. The casing seems to be fairly resistant to scratches, does not gather fingerprints, but is quick to gather oily smudge marks. The lid opens smoothly, but firmly up to around 150 degrees, exhibiting durability of the hinges that should last long. The overall build quality seems to be very good while the lid's rigid hinges hold well when using the touchscreen input. When closed, it measures 15" in width, 9.5" in depth, and 1.3" (3.3 cm) in thickness, making it more like a desktop replacement in dimensions. Its weight of 2.38 kg makes it difficult to carry around. The lid is rather thick at around 0.4" (1 cm). The LED-backlit display is a 15.6" (diagonal) LED backlit LCD screen with HD pixel dimensions of 1366x768. It features 10-point capacitive touch input capability. The left and right bezels are just around 1.5 cm thick, while the top and bottom bezels are 2 cm. 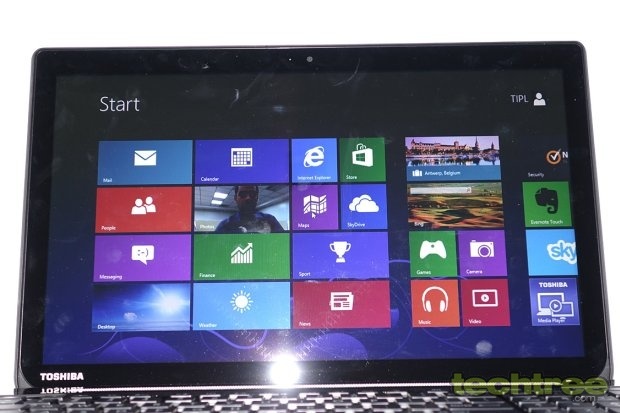 The size of the bezel is just right, making it easy to use the edge controls of Windows 8 UI. A webcam is present at the centre of the top bezel. While not Gorilla glass, the screen is very resistant to scratches. The island type keyboard is spacious with a good amount of space given to the glossy aluminium palm rest. The non backlit keys are nicely spaced out with a dedicated numeric keypad. While all the keys are of regular size, the cursor keys on the other hand are quite small. There are LED indicators on the front left to show the status of the various locks and other activities. The touchpad with a semi-matte finish is rather small, measuring 3" across and 2.5" in height. It is intelligently located towards the left of the user, right under the spacebar, to avoid accidental touch inputs. Mouse buttons have a clear demarcation between them. A power button with LED indicator is situated on the top left. Stereo speakers are present between the keyboard and the hinge, behind a perforated plate. 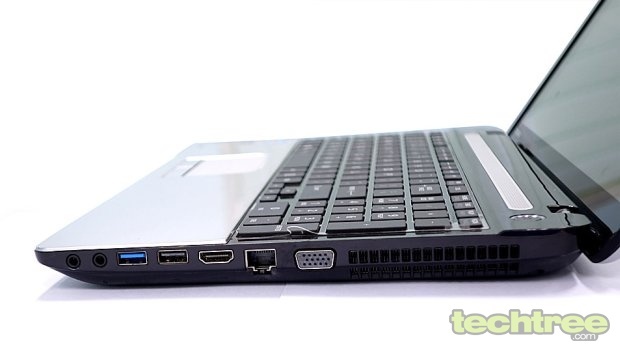 With the exception of the memory card slot that is present towards the front-right, all the ports are situated on either sides of the laptop. Two USB ports (one USB 2.0 and other USB 3.0) are present on the right of the device along with an HDMI port to connect to a bigger screen, VGA port to connect to older displays or projectors, 10/100 Mbps Ethernet port, microphone, and headphone ports. There is also a hot air exhaust grill. To the left we have the Kensington lock, one USB 2.0 port, and a tray-loading DVD drive. The underside has several ventilation grills to let out hot air that builds up inside the casing, allowing the laptop to run cool. A replaceable 6-cell 4200 mAh Li-Ion battery is present at the rear. You can replace or upgrade RAM and storage. Four rubber feet near the four corners slightly elevate the device when placed on a flat surface to facilitate air intake for ventilation and help to keep this device grounded. The Toshiba C50-A runs Windows 8 Pro 64-bit and is powered by a dual-core Hyperthreaded Intel Core i3-2348M running at 2.3 GHz with 4 GB of RAM (upgradeable to 16 GB). A 500 GB 5400 RPM SATA hard drive takes care of internal storage. The HDD supports password protection for hardware data security. The Intel HD Graphics 3000 integrated display adapter is present with Wi-Fi 802.11 b/g/n and Bluetooth 4.0. In addition to the OS, there are a host of bundled software from Toshiba. A trial version of MS Office 2013 and Norton Internet Security. The Toshiba S550CM boots in around 35 seconds, which is expected because it has a 5400 RPM hard drive rather than an SSD. 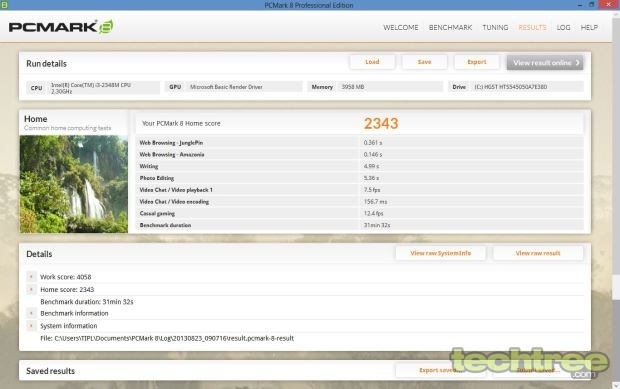 The performance is good in general, but the laptop starts exhibiting slight sluggishness when multiple applications are opened simultaneously with the antivirus running in the background. The keyboard has good ergonomics due to the comfortable 3.5 mm spacing between keys and it is not tiresome to type for long duration. The keystroke of 1 mm provides good tactile feedback too. 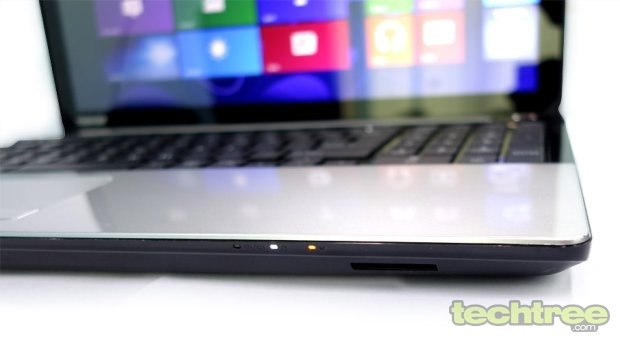 The small touchpad on the other hand makes it difficult to control the cursor and it is unresponsive at times. The screen's touch response is quite good and there is no noticeable lag at any point. There is some trailing, however, which somewhat spoils the experience. The glossy finish of the screen makes it very reflective and difficult to use with light shining from behind the user. The pixel dimensions of 1366x768 is low as individual pixels can be easily discerned and it would have been better to incorporate a Full HD panel instead. Being a TN panel, the viewing angles suffer badly, both vertically as well as horizontally, thus you can see deterioration in colours even at angles as narrow as 30 degrees in any direction. This becomes more evident when watching dark visuals as black colour quickly changes to grey when viewed from a wider angle. The colours appear a little washed out. The speakers are quite loud, but the emphasis is solely on treble, which is good enough to listen to dialogues while watching movies or serials. However, they seriously lack in bass and mid-range and you are better off adding a pair of external speakers or headphones. The Intel Graphics 3000 can easily play 1080p movies, but you shouldn't expect too much in the gaming department as that is not its forte. 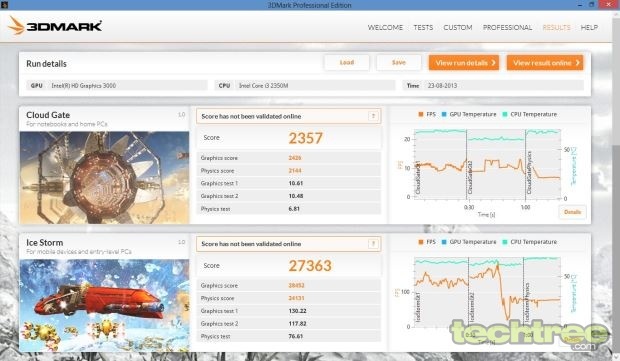 The laptop does not get too hot even when stressed, such as during the benchmarking process. 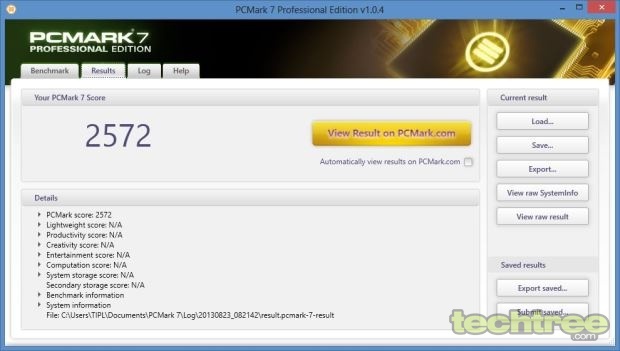 We conducted a few synthetic benchmarks to find out how the Satellite C50-A performs. 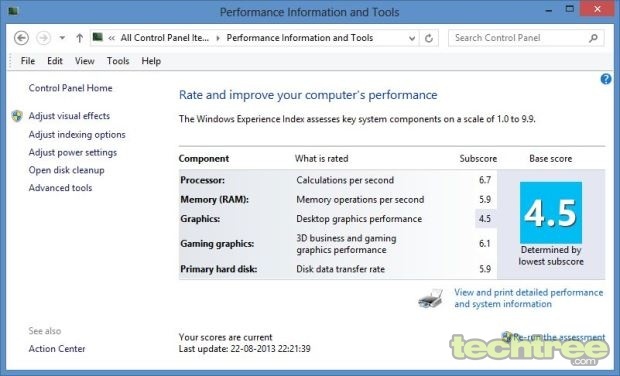 The benchmark results indicate average performance from the C50-A. The device is perfectly capable of handling office tasks as well as multimedia, and casual gaming. It does tend to slow down when the Sandy Bridge processor is taxed with excessive multitasking such as opening multiple programs and several tabs in browsers. A battery backup time of 1 hour 28 minutes was registered in the Classic test, while the Reader's test result yielded 4 hours 17 minutes. In normal usage that involves using office applications, surfing the internet, occasional music and video, and watching some YouTube clips, the battery lasted for over 5.5 hours. This is a below average battery backup for a Core i3 Windows 8 laptop powered by a 6-cell battery that does not even contain a power hungry dedicated graphics card or a Full HD display.